THE FATHER-SON DAY OF SERVICE invited fathers and sons to partake in community service across Los Angeles; activities included packaging food and building houses. 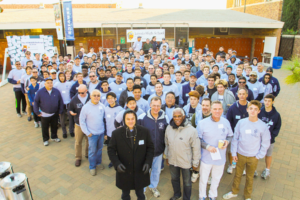 During the third annual Father-Son Day of Service, approximately 250 Cubs and their fathers registered to participate; the event, which took place on Dec. 3, invited the Loyola community to go across the city to serve. Faculty members who participated included President the Rev. Fr. Greg Goethals, S.J., ‘73; theology teacher Jack Krouse, S.J. ; Fr. Gerald Hudson, S.J. ; Community Service Director Tom Zeko; Community Service Coordinator Angela Moran; and Principal Frank Kozakowski. The day of service began at 7:30 a.m. with a short breakfast and briefing led by the Fathers’ Club president Gregory Phelps and Fr. Goethals. 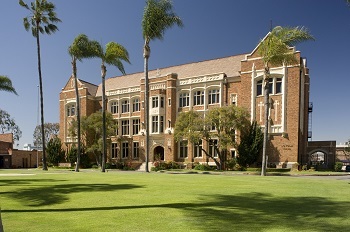 After the briefing at Loyola, the father-son teams went to one of seven service sites around the greater Los Angeles area including Habitat for Humanity in Pasadena, the Pasadena Ronald McDonald House, the Los Angeles Ronald McDonald House, the Los Angeles Regional Food Bank, the Alexandria House, Homeboy Industries and the Villa Esperanza Services Pasadena. All of the activities that the father-son teams participated in were hands-on. Some of the services that the teams performed included passing out food, helping the elderly, installing solar panels and building houses.